We invite you to visit Bridgeview Yachting Centre by boat so you can see for yourself why our members have chosen Bridgeview as their "Summer Home Away from Home." 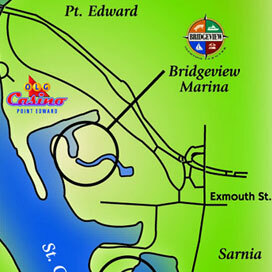 From Lake Huron: Approaching from Lake Huron, proceed under the Bluewater Bridge into the St. Clair River and you will pass the Point Edward Casino on your port side. 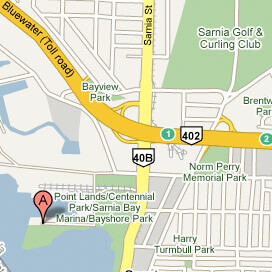 In about 1/2 nautical mile you will see a red pencil buoy at the end of spit of land that juts into the river. Keeping the red marker on your port side, make a gradual turn around the south side of the buoy and you will be entering Bridgeview Yachting Centre through what is commonly referred to as the North Slip. From Lake St. Clair: Traveling up the St. Clair River, you will pass by several refineries on your starboard side and as you near our harbour you will see a disabled railroad lift bridge on the US shoreline at the entrance to Port Huron, Michigan. To the north you will see a spit of land marked with a red buoy at the end. As you approach, keep the marker on your port side. 3. Turn right onto Venetian Blvd. 2. Turn right (South) onto Front St.
3. Turn right (West) onto Exmouth St.
4. Take first right onto Venetian Blvd.